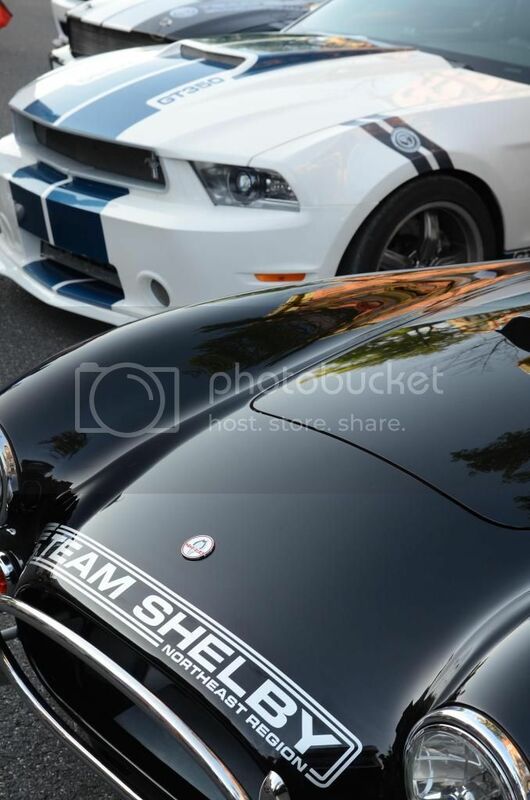 Team Shelby Northeast and SMC Events, in conjunction with Summit Point Raceway and Carlisle Events invite you to join us for another amazing weekend featuring Ponies at the Point, and the 2016 Team Shelby East Coast Nationals. 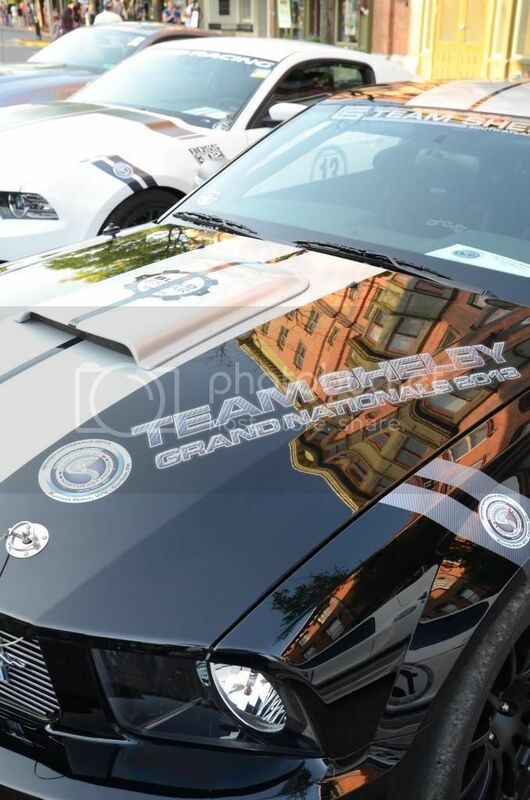 Although co-hosted by Team Shelby, the invitation is open to all enthusiasts of the Ford marque and their “Blue Oval” vehicles. The weekend begins early on Thursday, June 2nd with a full day of on-track fun at Summit Point Raceway in Summit Point, West Virginia. Breakfast, lunch and dinner are all provided. In car driving instruction will be available (please RSVP for this). 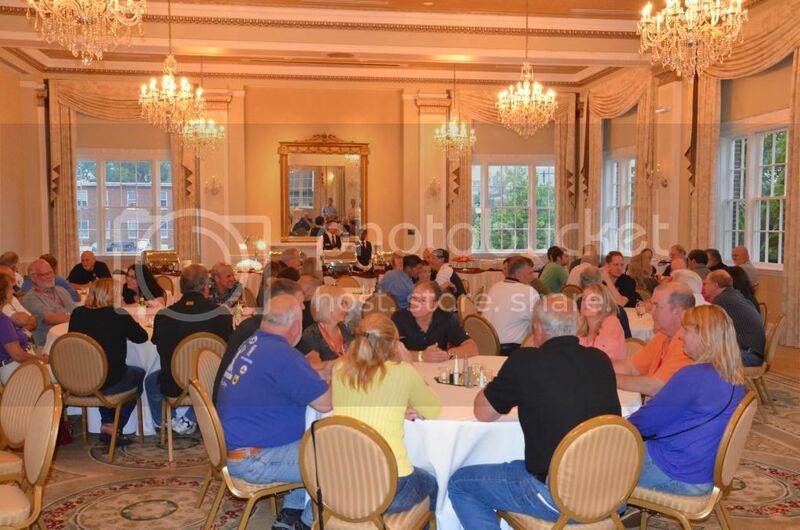 Thursday night is a Banquet dinner with special guests and VIP’s, at our host hotel, The George Washington. (http://www.wyndham.com/hotels/virginia/winchester/the-george-washington-a-wyndham-grand-hotel/hotel-overview) Please be sure to make your own hotel reservations. Rooms are being held at a special rate for Ponies at the Point attendees. After breakfast, we host a 100 mile Poker Run from Summit Point, WV, all the way to the fairgrounds in Carlisle, PA. We will stop for lunch at the Shamrock Restaurant in Thurmont, MD. They will be preparing a special menu for us and providing a Poker Run parking area (price of lunch is not included in registration). There will be plenty of “photo-op’s” along the way, as our route takes us off the highway and along the path less traveled, including a nice stretch of Michaux State Forest. Once we arrive at Carlisle, where the Ford Nationals will be underway, there will be plenty to keep you busy until our evening program begins. On Friday night June 3rd, Team Shelby will invade the Ford Expo Center for some Texas style BBQ and socializing (BYOB). If things go well, there may be a few surprise guests and presentations as well. Once the sun begins to set, we will bring back our popular “Cars Under the Stars” car show. Everyone has been to a car show during the day, but how many of you have experienced one during the twilight hours, and then under the light of the moon and stars? Stop by the Team Shelby hospitality tent anytime over the weekend to grab some shade and rest your feet, while you prepare yourself for the rest of the day. There may even be a cold drink waiting for you there. Saturday June 4th is the busiest day at Carlisle. 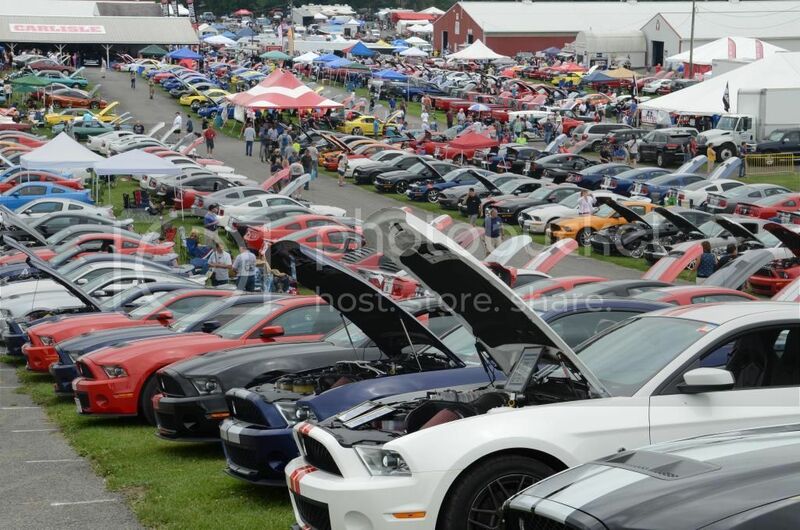 Wear your comfortable shoes and prepare to walk, as there will be close to 3000 (if not more) cars on the show field. Then there are also the vendor displays, the Ford Expo Center, indoor featured marque displays, and the swap meet area. In the afternoon there will be the burn-out competition, as well as the Ms. Carlisle contest. Later in the day, if you have registered for the parade, all our cars line up for a short cruise to downtown Carlisle. The center of town is blocked off and only the parade cars are allowed to drive in and park. You will be on your own to enjoy the live music, restaurants, and shops around the center square. Sunday morning, enjoy one last walk through the fairgrounds, then head home! Our host hotel is the “New” Comfort Inn in Carlisle, PA. (www.comfortinncarlisle.com ). The hotel is brand new, and will open in April, so we will be one of the first groups to stay at the hotel. The hotel is approximately 3 miles from the fairgrounds. In order to get the Team Shelby rate, you will need to call (717-706-3400) to make your reservation after April 18th. Rooms will be held until mid-May, after which availability may be limited. The Team Shelby rate is $159.00/night. You will need to make the hotel reservation on your own, as it is not included automatically as part of event registration. 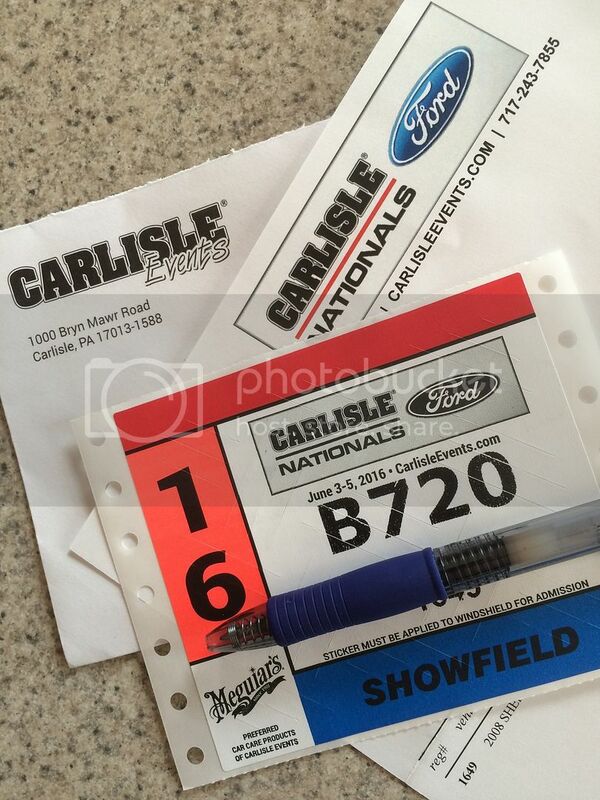 You also need to make your own reservation for admission to the show field at the Carlisle Ford Nationals. (http://www.carlisleevents.com/carlisle-events/carlisle-ford-nationals/default.aspx) Make sure to indicate you are registering with Team Shelby (there is a ‘pull down’ on the registration form), and be sure to indicate if you are participating in the parade (this cannot be added at a later time). If you register prior to May 2nd, and select the “Gate and Go” package, Carlisle will mail you your entrance pass, then you can drive directly into the show field without having to stop at registration and stand in line, to pick up your credentials. T-shirts are available on-line from Morgan’s & Phillip’s Speed Shop (http://www.mpspeedshop.com/#!product/prd1/4514181441/ecgn-shelby-tee). Buy one today so you can wear it during the weekend. Only a very limited supply will be on hand at the event, and they will surely sell out quickly, so purchasing them on-line is the way to go. Buckle up, hold on, and have some damn fun!!!!! Z-Man, is there any way of knowing that this will also happen again next year? I'd like to plan for it well in advance so I don't miss it again. 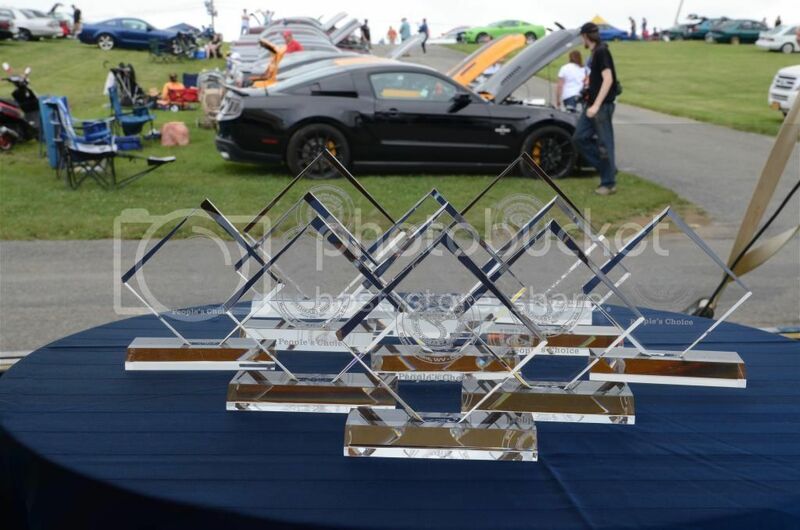 We plan this event to coincide with Ford Nationals at Carlisle, which happens every year in early June. So if you plan for Carlisle, you will be okay. As far as if we will do it again next year, I'd like to say yes, but ask me once this years event is complete.....assuming I make it through alive. OK, Ill do that. And I'm sure you'll make it though alive ... because you must!!! Thanks! WAIT!!! Are those real GT350's??? We're gonna have some damn fun now. .... and just so you know, the owners biggest concern with attending was that we would drive too slow and not let his Shelbys run. We told him that wouldn't be a problem. I would just like to add that my house is only 5 miles from the track. If anyone is considering attending but is concerned about tracking their car far from home there is no need to worry. If something should happen I can provide basic hand tools and if God forbid your car is unable to continue on to Carlisie you can store it safely in my garage until you can make arrangements to get it back home. Since my car has never seen a trailer this has always been my concern when I track my car far from home. So I thought I would just put this out there. Nice gesture Shepp! That would be, and still is, one of my biggest concerns with tracking the car .... something happening. Which incidentally is why I have never tracked it! What a great offer Shep. HPDE track insurance IS available through Lockton-Affinity. Another thing to be less worried about! Just a reminder that "Gate and Go" registration for Carlisle ends on May 2nd. After that, it will cost you more, and you will need to stop and pick up your registration documents when you arrive at the fairgrounds, rather than just driving straight in. I registered for Carlisle, and the parade, today. ^ Last weekend to sign up for "Gate and Go" registration for Carlisle, otherwise be prepared to stand in line when you get there. .....and register for the Team Shelby East Coast Grand Nationals while you're at it!!! Rotors turned, new pads, new brake fuild, removed the plastic center caps. Just need an oil change and I am ready to go. Hope my new gauges get here in time. I think I am good to go! Which hotel is everyone staying at? Is it the "Comfort Suites Downtown Carlisle" ? Our host hotel is the “New” Comfort Inn in Carlisle, PA. (www.comfortinncarlisle.com ). The hotel is brand new, and will open in April, so we will be one of the first groups to stay at the hotel. The hotel is approximately 3 miles from the fairgrounds. In order to get the Team Shelby rate, you will need to call (717-706-3400) to make your reservation. Rooms will be held until mid-May, after which availability may be limited. The Team Shelby rate is $159.00/night. You will need to make the hotel reservation on your own, as it is not included automatically as part of event registration. Nancy and I are all signed up. See you all there. Shhhhh... It's her birthday weekend. 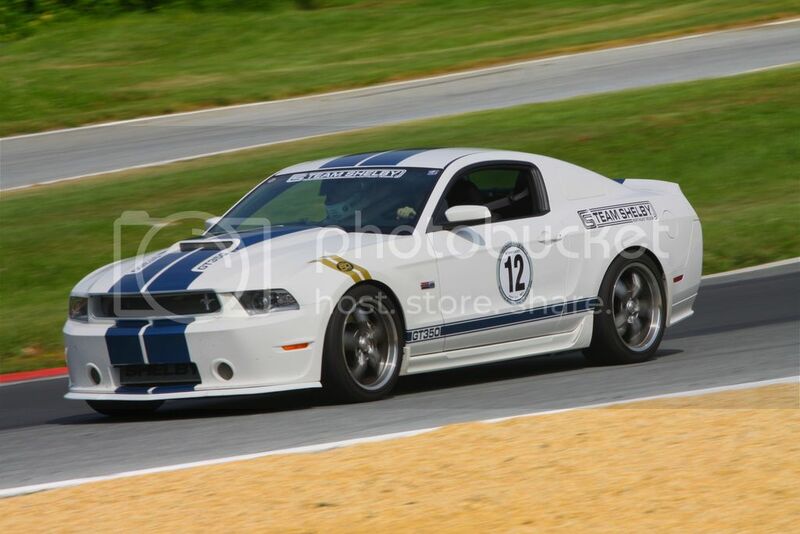 So far we have a '65 GT350, a '66 GT350, an '07 Super Snake, an '09 KR and an '11 Super Snake signed up among others. Still waiting for the first new GT350 to register! ^ Dude! Don't you know to never read the "fine print".....the 'fine print' spoils all the fun. Seriously though, we are looking into it. Can't imagine they would offer us insurance for an event located in a state they can't do business in . I have emailed them as well as the track. I'll update as soon as I know something. Nice cars. Sound like a great event. Any chance you could make your sig pic larger? I can almost see it with my glasses off. "It means that they aren't licensed to do business in WV or any other State as an Admitted carrier. The only down side to you would be if our insurance company were to be financially unable to pay your claim. If that happens, you would not be able to seek relief form the WV State Guaranty Fund. Don't worry, out insurance company is in a very strong financial position at this time and if that were to change, we would move the coverage to someone else or let you know you need to purchase your coverage elsewhere"
IMHO, I'm good to go with that answer. Our "Rally Master" for the Poker Run (aka Sheppd01) did a reconnaissance drive this past weekend to make sure the route that was planned, was as good in reality as it looked on paper....it was. Sheppd01 reports there are lots of twisty roads, and some nice elevation changes. He thought you might like to see a preview for yourself, so he asked me to post this short GoPro video of some of the roads. If you like what you see, there is still time to sign up for the event. This is just the first half of the drive, up to our lunch stop. If we get some good comments, maybe he will share the second half later this week. Do not plan on picking one (or two, or more) up at the event as I'm only bringing a few as samples. If you want one, order it on-line. You do not need to be registered for the event to purchase a shirt. NOTE: Shirts are now available at above link!!!!! Look what came in the mail this weekend!!! !